D- wrote: Go Team Belgium! In 2 words: MISSION ACCOMPLISHED! It has been a great day for us. Our Antwerp star player decided yesterday he'd be coming along with us, so 3 Belgians were present in Utrecht: Sweeping Bram, Rookie Nick and me. Nick was quite uncertain about his first tournament. He had come over to my place on Friday to get some help on his decks. We decided his blood brothers might not be the optimal choice, since we lacked the cards to fully put it together as we wanted and I didn't really believe in its possibilities. His other option was a deck involving hunting grounds and Santalaeous, but it was still very experimental and it costed to much pool to play right. I managed to convince Nick to take out some of his fun-cards (malkavian time auction and such) to make room for more useful things (like giant's blood or pentex). the goal was to get Santa and hunting grounds, use the call for more vampires, misdirect through the middle game and use DEM + OBF to win the end game. Another issue was his crypt. We ended up with only 4 santa's between the 2 of us, so we still had to find 8 crypt cards to fit. Nick insisted on 2 gem ghastly, since she had fitting disciplines and could play the ventrue hunting ground. We both agreed to put in 2 Jacky's, to be able to get a perfect early game bleeder. I then advised some more lower caps, since santa and gem are rather expensive and he needs pool to pay for his masters. Nick chose for Persephone and Bloody Mary, arguing they had the extra bleed, the good disciplines and Santa could call them out. the mix of cama and antitribu meant he could play more hunting grounds. I still had my doubts, so when Bram called me Saturday to propose to ride together, I asked hem to bring along his santa-deck to give some more pointers to Nick in the car. Unfortunately, he wouldn't stop at home anymore. So that option was of the table. I myself didn't manage to get the ashur tablets together to play what I wanted, so I put together Lucien's version of weenie dementation with just 1 goal: get qualified. I took along my weenie presence vote and my Ahrimanes, in case we needed a spare deck. Nick arrived at my place around 8 a.m. I drove to Antwerp and we picked up Bram around 9-ish. We made a pit stop for some cards at Mil's place and then drove to Utrecht. DeckDoctor Bram looking though Nicks decks and gave it some last tweaks with the cards we had in the car. Everything went smooth, until we arrived in Utrecht and we couldn't manage to get in the parking lot due to traffic works. We spent half an hour driving around until we dumb-lucked on a non-paying parking spot not to far away from the venue. Nick's GPS had a walking function, so we managed to arrive at the tournament 'only' 7 minutes late. Lucky, some else was even later than us, so it didn't really matter. There were 16 players, so we had 4 tables with 4 people each. We all sat on different tables. I ended up on a table with 4 bleed-decks. my prey got the fasted start (1-caps with computer hacking and leverage), but I managed to bleed the most and regained pool with kindred spirits. My predator was the kindest man at the table when it came to bleeding, since he was somewhat combat-oriented too. I ousted my prey quickly. Jeroen (who started as my cross-table) ousted my predator and then I managed to oust him. 1 GW and 3 VP's in little over half an hour. I was qualified and my day was made. Goal achieved! I went to check on my buddies. I saw Bram with a Anneke (holding her magnum) playing a parity shift on his prey and dividing the pool with his crosstable buddy and even his predator, so I knew he was fine. I went to look at Nick. He was caught with a deflecter as a prey and a nosferatu-voter as predator. So nick got deflected, ousted his cross-table buddy and got killed on the votes. He made a small error by discarding a restructure, thinking he couldn't steal a ponticulus with it. Nick got ousted with 0 VP, so we went to get some food while Bram swept his table. I had Bram as my prey. We discussed this briefly before the game and calculated that splitting the VP's 2 by 2 (so getting Bram to oust 2 people and then me ousting him) would be the most beneficial and would probably get us both in the final. We decided to play out the game and see what happened. I didn't have the best start, but started raining the bleeds on Bram none the less. I got him down to around 6 before he managed to get fully built up. I decided to play for the win and saw bleed after bleed getting deflected. Bram's prey got ousted. That left 3 of us, with the 3rd player having Carna and access to aggravated damage. we were both rather reluctant to do anything about it and seeing that I wasn't going to get through Bram's wall anymore with him gaining that 6 pool, we agreed to oust the tremere-player and allow me to withdraw. It went down accordingly: I got 1 VP, Bram got 3 VP and a GW. I didn't have time left to check on nick's game (Anneke's fault! ), but learned he had swept his table, taking 4 VP and the GW! He told me the seating was favorable, the cards just came as they supposed to were and everything went smoothly according to plan. I was very happy for Nick, especially since it meant he got qualified and I could start talking him into coming to Mannheim with us. I had Martin Schumacher cross-table, which was a problem for me. I was quite certain I could quickly oust my prey, but I knew he'd spend all his resources trying to block me off and allow Martin to build up his impenetrable Saulot-wall. I calculated that 1 VP would ensure me of a place in the finals, but I had to take down Martin to get a better seating and help Bram get the top seat in the finals. I had to set priorities and decided my place in the finals was the first concern. I had a good start and the game unrolled as I had predicted. I gave Martin a hell of a bleeding and went through my deck in search of ever more stealth to be able to get my bleeds through. Only after seeing all my cards (both crypt and librabry), Martin was able to oust his prey and me. But still, the 1 VP meant I was in the finals. Nick sliped into the finals at 5th place! I was 4th and Jeroen (Oort) 3rd. Martin and Bram tied for 1st, so the die decided Bram got top seat. Seatings were chosen as follows: Bram -> Jeroen -> Martin -> me -> Nick. Yes, nobody was crazy enough to come sit in front of me, so it meant I'd have to be the one to oust my buddy. Yet, I faced the same dillemma as in round 3. Quickly ousting my prey, meant my grandprey (Bram) would have the time to build up and raise a magnum-wall. My options were limited and making a deal with your prey is a difficult thing to do in a stressful situation as this. so we decided to play it out and see where it went. I ousted Nick, but not before his santa cancelled my pentex on Anneke. So plan A for sweeping Bram failed. Jeroen's powerbleeds came according to plan and he ousted Martin. I knew I had the worst position with a wall in front and a Lasombra bleeder+ deflecter in my back. I decided I needed to get Jeroen on the defensive, if I wanted to have any chance at surviving and being able to hurt Bram. So I did some backwards bleeds and actually succeeded in my goal to some degree: Jeroen deflected my bleeds back to Bram and took some losses himself. Meanwhile I had my plan B running to deal with Bram: anarch troublemaker. The flaw in the plan was the gazillion of second traditions Bram was packing, which he kept getting back with his ashur tablets. So in spite of the troubleamaker Bram managed to first oust Jeroen and then take me down. 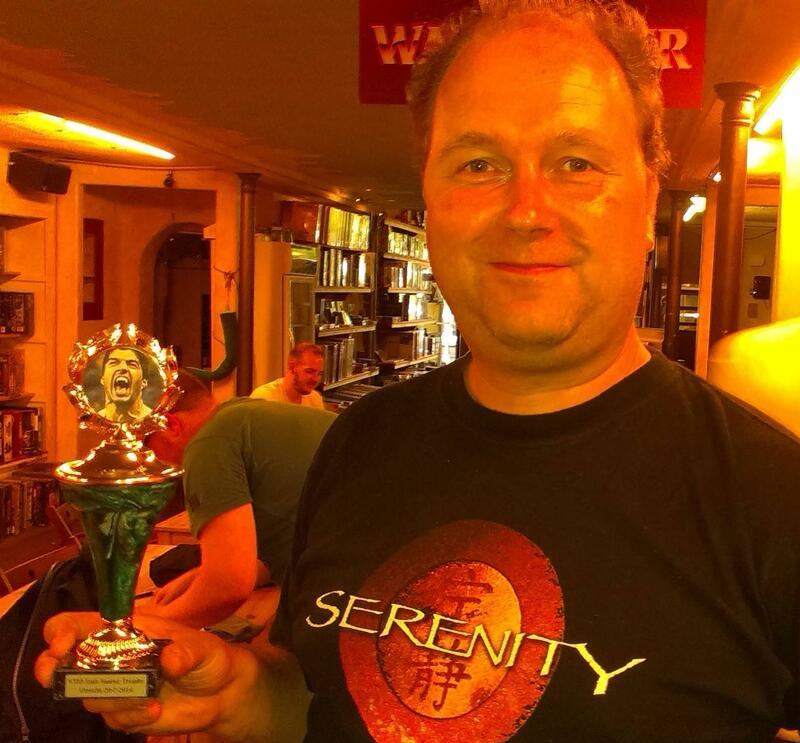 Congratulations to Bram on winning the Dutch ECQ! And ofcourse congratulations to Nick on qualifying and making it into the finals on his very first tournament. Special thanks to Jeroen on organizing such a fun event. And another congratulations to the friendly Dutch guy who really deserved to win the "Luis Suarez"-trophy. I had a great day, met nice people and learned a lot. Yet, the day also brought me a new dilemma: What to do with a wall as a grandprey??? I'm sure my national coordinator will be able to provide me with a wise one-liner (such as "Always remove Smiling Jack!" or his newest "you can only start trading away vileins if you have over 2000!"). Oh, I almost forgot: did I mention I got qualified? Last edit: 4 years 9 months ago by squirrel. Thanks for the report, Tom, a very good read! And many congratulations to Bram and the whole team Belgium!!! Thanks for attending guys, looking forward to return the favor. 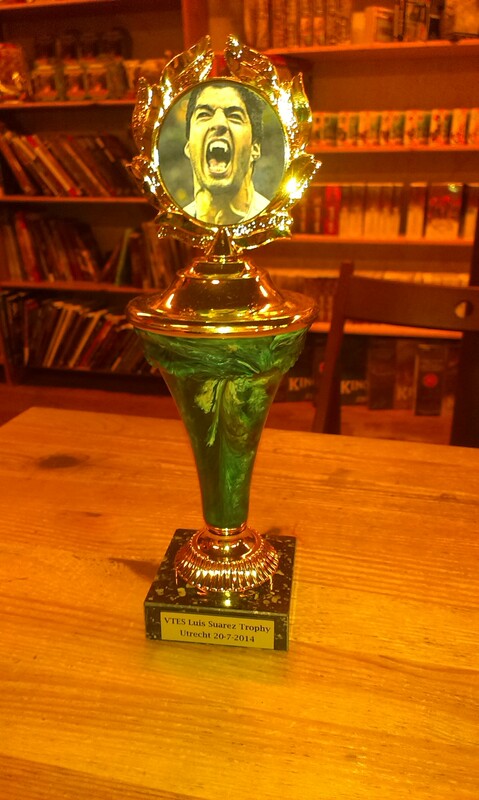 By the way, the Luis Suarez trophy was won by Baali Justicar (Rolf), voted by the players to have the most original deck this tournament.